Chef Bella Boards are beautiful solid maple cutting boards that are personalized on both front and back for your client or occasion to make a lasting and memorable gift. The standard rectangular board measures 18” x 12” and is 1 3/4” thick* which is a nice chunk of American grown maple that can be used daily with a small amount of care. The boards come with 4 rubber feet allowing them to be put on most surfaces without the worry of scratching. They are incredibly useful ranging from chopping vegetables to cutting bread and they look good enough to use at the table. Our standard cheese board is a 12” round board that is also 1 3/4" thick*. Price is $90.00 plus any applicable taxes and shipping. what greeting you would like on the back on our Order Page. We ship 2-3 weeks after processing each order. Timeframe will be longer with custom orders, multiple orders of 10 or more, and if you are paying by check. Use food grade mineral oil or a quality food board product only. Hand wash with warm water and a mild detergent and allow to dry thoroughly. Do NOT immerse in water and do NOT put in the dishwasher. "Recently I received a gift that is now the best part of my kitchen. It is a cutting board from Chef Bella Boards. 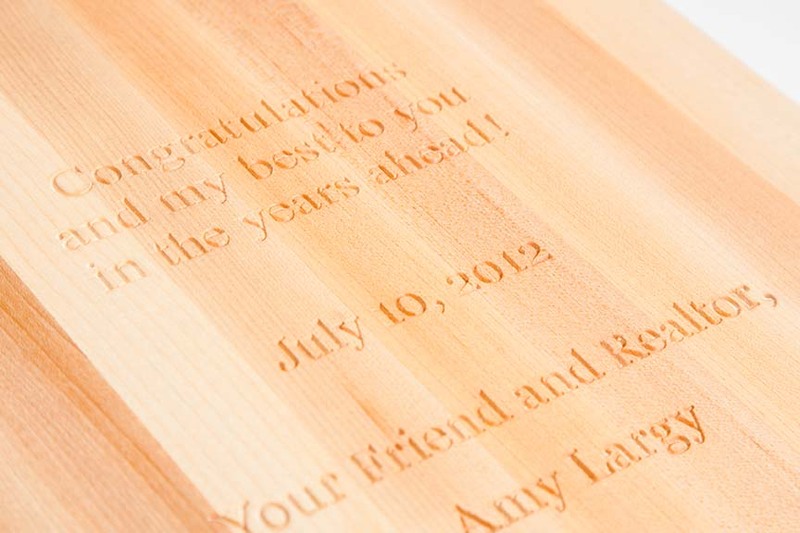 Inscribed with my name and the five couples I had the pleasure to marry, it is the best cutting board I have ever had. The perfect size for a kitchen, easily cleaned, with a heightened surface that is just right for slicing, dicing, and chopping. My parishoners know I love to cook, and now I can't imagine my kitchen without this wonderful cutting board!"